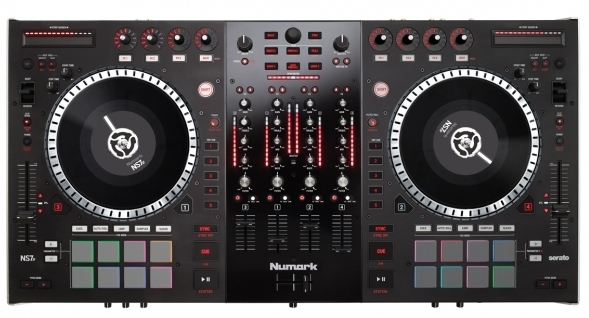 Numark is marketing the NS7 II as the “best DJ controller ever. Period.” If by “best” Numark means “biggest”, “heaviest”, or “most similar in look, feel and weight to two real motorised turntables and a mixer”, well – there’s absolutely no arguing. However, forget the marketing talk for a second: The Numark NS7 II is absolutely a landmark controller. Its predecessor, the NS7, was unique in the market (for most of the reasons mentioned above), and is the one controller that I still dearly wish I owned, mainly for its sheer purity of spirit. The original NS7 really does feel like DJing on turntables, not least because – due to its slim feature set – there’s not a whole load else you can actually do with it. (The original model didn’t even have an FX section!) 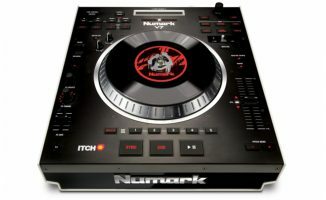 But the Numark NS7 II enters a very different world to the one the original NS7 was part of just a few years back. Nowadays, four decks is normal, pad triggers are so two-a-penny they’re almost passé, the minimum expected quality of effects on a DJ controller has risen exponentially, dedicated channel filters are expected, standalone mixer capability is taken as read. Yes, the bar has shifted upwards considerably as to what a high-end DJ controller should have. 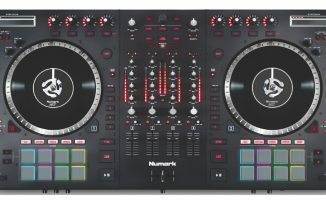 So to call the NS7 II the “best DJ controller ever” would indicate that Numark has thrown everything – quite possibly including the kitchen sink – into the spec of this one. And, as it turns out, that’s not so far from the truth. But best? Let’s take a closer look, and see. At the same time, we’ll decide if the NS7 II justifies something that certainly is an unarguable fact: That it’s pretty much the most expensive DJ controller ever. Even back in the analogue days of full-sized mixers and solid metal Technics turntables, such a set-up was at least modular; you had two turntables and a mixer to hump around but you got three trips to carry it all where you were going, unless you were one of the hardy souls who actually opted to have such a set-up in a coffin case. But with the Numark NS7 II, you’ve got no choice. Once you’ve put one of these in a hard case (which if you’re going to use it to play out on, you most certainly should), you’re going to want a helper when you carry it. To get the NS7 setup, you fit the platters, then these slipmats, then finally add the vinyl/spindle clamp. So, break through the outer plain box and the inner plain box, and you get to the black and white printed third box, inside of which is a considerable amount of polystyrene moulded protective padding and, finally, the unit itself. As delivered, the platters (you can’t call these jogwheels, as they’re proper, motorised platters just like turntables) are not attached. Single-piece cast steel, they slide over the spindles on each deck. Then, you put two (rather cute) Numark NS7 slipmats onto each platter, followed by an adapted piece of 7” vinyl. It’s all feeling strangely kitsch at this point, especially as each piece of vinyl has a permanently mounted centrepiece. The idea is that you slide this over the spindle, and then using a small supplied hex key, tighten the “vinyl” onto the spindle. Having done that, moving the vinyl moves the spindle and so the control mechanism within the controller, which is actually a similar mechanism to that found on any jogwheel; the motorised platter underneath is actually completely unnecessary to the functioning of the unit. After all that, the NS7 II actually feels rather small, which is an absolutely ridiculous thing to say, because it’s the biggest digital DJ controller ever made! But it does; while the “decks” look great, they’re only 7” not 12” as per real turntables. Likewise the mixer – while looking perfectly spaced and professional – is not the same size as a “real” club Pioneer mixer, for instance. The NS7 II is perfectly proportioned, though, and with its wedge shaping at the left and right, it looks quite sleek… in a “this is the kind of gear that gets things done” sort of way. Truth be told, the thing is a joy to behold. It’s clearly been made with no hint of compromise anywhere; everything’s bolted on and down, and the colour scheme is smart and professional, the lower shell being silver steel, with a sleek black metal upper (shiny under the mixer section, matt under the decks, Traktor S4 style). The lower shell is silver steel, with a sleek black metal upper (shiny under the mixer section, matt under the decks, Traktor S4 style). Remember we haven’t turned this thing on yet! You probably won’t either; you’ll just gawp at it like we did, pressing buttons and spinning those turntables, which by the way feel utterly authentic in every way (you forget instantly they’re smaller than “real” turntables). Pull off one of the knobs, and you’ll see that they’re not only bolted down but not even to the top plate; there’s a second plate underneath the metal surface of the unit, making it dual-skinned (we told you it was heavy, we’re starting to see why now). This is good, by the way. Look underneath and there are eight jumbo padded feet and a plethora of cooling slots, which also extend to the sides; there is, in addition, ventilation for a small fan at the back. The glossy metal front panel dips underneath the left and right decks with a raise in the middle mixer section, like the Novation Twitch does (although this is a shape comparison, not a size one!). It contains the XLR/jack combi input for one of the mic channels along with its gain, bass, treble and on/off button; a crossfader curve knob and crossfader assign switches for the four mixer channels; and both 1/4” and 1/8” headphones outputs, with volume, cue/mix, and – unusually on today’s DJ controllers – a split cue button. Round the back, we start to see big departures from the original two-channel NS7. 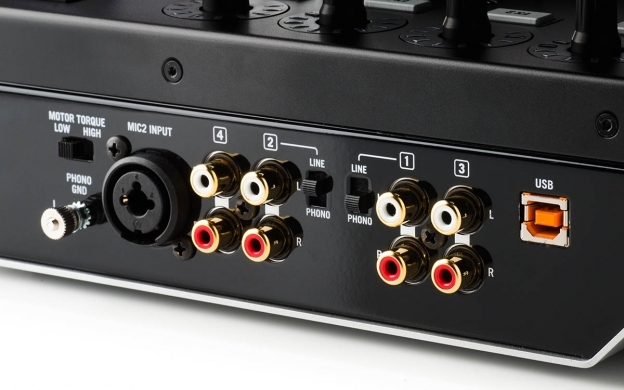 To start with, there are RCA inputs for all four channels, two of which are switchable between line and phono (with ground pole). There’s a second TRS/XLR combi mic input, which this time can be routed through your choice of the main four channels. There are RCA and balanced XLR master outputs and an RCA booth output. And hinting at how seriously Numark has taken getting the motorised platter to feel “just right”, there’s a switch for high/low motor torque. A power switch plus IEC (“kettle lead”) power and USB sockets finish the features here. The obvious main changes from the original NS7 are the addition of two more channels, and the eight performance pads per deck, underneath the 7” platters – the latter being the main reason for the fact that the decks, front to back, have quite a lot of depth. Most of the main controls on the decks are mirror images of each other, which makes sense on an all-in-one unit, and even though this is a complex controller, the design is such that everything is clear, logical and well-spaced. As mentioned previously, the paint finish on the decks is matt, that of the metal under the (rather slim) mixer being glossy black. It’s a pretty well-specified mixer, with four full channels each containing three-band EQ, dedicated combi filter and completely flexible switching between the corresponding software channel, the second mic input, and one of the external line/phono inputs. There’s a 12-bar VU for each channel, and a stereo master 12-bar VU as well. A comprehensive track browsing and loading section top the mixer, flanked by the booth/master volume controls and FX switching buttons. The mixer is high quality and well specified, although it is the most cramped part of the controller overall. The faders and knobs themselves are all top quality. The line faders, while quite short, are reasonably loose, but not as loose as the crossfader, which feels almost as good as the best-of-the-best Vestax scratch mixer ‘faders to my untrained hand. It is silent, with next to no resistance. The knobs, meanwhile, are black, plastic and rather small, apart from the filter knobs which are appreciably bigger; all the knobs have painted white lines to show where they’re set, and a touch of class added by being metal-topped. Dominated by the motorised real vinyl platters and the Akai Pro performance pads, the decks themselves take up around three-quarters of the top surface of the unit. Everything is well laid out, with no sense of anything being “crammed in”. The large rubberised play/pause, cue and sync buttons are stacked vertically, Pioneer style, and the really long-throw pitch controls have decent resistance but remain smooth and secure feeling. There are five vertically stacked hot cues per side, sensibly positioned deck switch buttons, and master tempo and pitch control range buttons tucked just above the pitch faders. Among the more unusual controls are a dual sensor / reverse rocker, a slip mode button, a motor off option (to disable the platters entirely), hardware beatgrid adjustment, and the excitingly titled “filter roll/filter FX” and “touch/touch lock” buttons – we’ll get to what these do shortly. 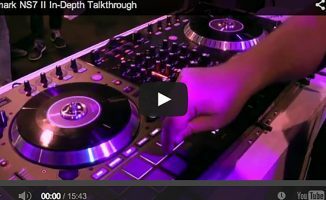 Numark’s commitment to making the platters central to the experience of this control shows again here, with an independent start time and stop time adjusters for each motor (a la early Numark gear and more recently, the Denon DJ SC3900, for example). Necessary-but-prosaic shift and pitch bend buttons are present and correct, and at the top of each deck are four endless rotary encoders for each FX section (the final of the four is stepped, the rest smooth) with 11-bar LED surroundings, and a strip search touchstrip, again with LEDs to show how far through the loaded track you are. This is a controller for Serato DJ, of course, and clearly, you get a licence for a full version of the software with it. Unusually for a Serato controller (at least, on a Mac), this unit needs drivers to work. (I’m told it’s a Serato DJ thing, new since ITCH.) There’s a really simple quickstart guide included, that shows you where to go to get them (as well as how to install the platters), and after a quick procedure that included a restart, it was off to Serato to get the software. Even though I’ve got an account I had to verify my email address, which was tedious, but as soon as the software was downloaded and installed, we were ready to go. Clearly, the first thing you do is get music on. Loading Crazy P’s mix of Danism’s “Love The Way” (having worked out the fact that you need to select a layer then use load A/B to hit the correct deck; maybe four load buttons would have been simpler), I pressed play and watched the platter spin as the first beat kicked in. Turning the volume up loud through our Reloop Wave 5 monitors and putting the filter back to the middle from where it was erroneously set in the LPF half of its reach, immediately illustrated two things to me: Firstly, the sound card is sweet, and secondly, Serato’s filters really do sound excellent! Next, of course, I headed to those platters. How near to “real vinyl” would they feel? The next thing I knew, it was 20 minutes later, and I was grinning from ear to ear like a daft kid with a lollypop. They are unbelievably good – exactly the same, so memory serves me, as the original NS7. That is to say, they’re just like using real vinyl, without the worry of a tonearm. I found the vinyl to be “stuck” a little too much to the slipmats at first, until I realised that just by loosening the hex bolt and moving the vinyl up a little on the spindle, then retightening, I could have it as tight or loose as I wanted. Now things got even better, as truly great sounding spinbacks became possible, and it just felt right. Actually using the controller felt like driving a luxury car… every mod con you could imagine was there, and it felt like half of the features had been added just to delight you. I prefer my platters to spin at 45rpm, but these were definitely irking me by running at what I guessed was 33. Hitting the software preferences, I discovered that by altering the 33/45 setting in software, the deck speed follows suit. I have to be honest, at this point, I just lost the plot and DJed for the next 90 minutes flat. I’d been well and truly won over. Within that 90 minutes, I discovered the slip mode, and more accurately, the genius of scratching with slip mode on (you can always drop back in on the beat, because slip mode remembers where you “are” in the track while you’re largin’ it up attempting to scratch like a pro…). Remember my luxury car analogy? The only way I can describe the actual DJing experience of the Numark NS7 II is that it’s like setting off on your journey, while the car tethers your Phone to Bluetooth automatically, the music you were listening to last streams automatically through the speakers, the seat auto-adjusts to your shape and size, you discover the steering wheel is heated, and the bloody thing making you a cup of coffee for good measure! Luxury defined. Each of the decks has eight Akai Pro pads, which feel great and are, in just one of the use cases below, velocity sensitive. They’re also – an more importantly by far – multicoloured, so over time you’ll instinctively know what mode you’re in by the colours selected (assuming you’re not colour blind of course; the two sampler modes looked awfully close in colour to me, for example). Some of Numark’s entry-level controllers have “pads”, but they basically do very little of what pads are expected to do on DJ controllers, being just shoe-ins for the old-style control buttons that they replace. Here, though, pad implementation is probably the most complete of any DJ controller, the Pioneer DDJ-SX being the only other unit that comes close. 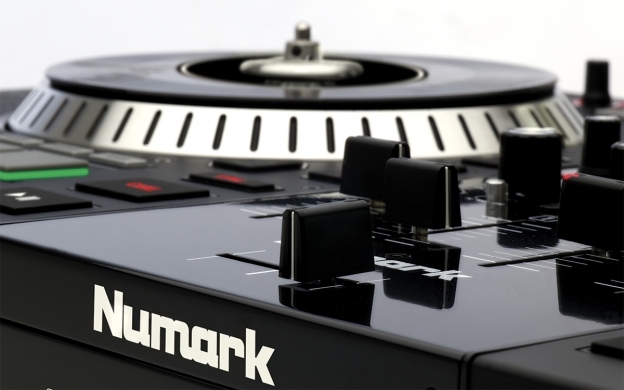 The Numark NS7 II’s pads are Akai Pro sourced and feel excellent. They add a lot of power to the controller, too. Overall, the pads offer an awesome level of control over your music and are an integral part of what makes this controller good. I think it’s useful, though, that the first five hot cues are split out and have their own buttons away from the pads up the side of each deck, because these are probably the ones you’ll use the most, and that means you can leave the pads set to something else while still having instant access to your most-used hot cues. (One of the disadvantages of the pad paradigm is that there is always one button push more to get to the function you want than if everything had its own dedicated controls, and the NS7 II thus gets around that for both hot cues and your second-favourite feature in this way). One feature that’s pretty unusual on the NS7 II is “touch mode”. This lets you do stuff by simply touching knobs, rather than moving them. While the fact that the knobs are metal topped might suggest that this is the part you touch to make them do this, in fact, it doesn’t matter where you touch them to activate this function. There are two sets of controls that you can use touch mode with and two touch modes. The first affects only the FX knobs and is activated by pressing the “touch” button. Then, by touching any of the first three FX knobs on that deck, you turn that effect on (or that parameter) for as long as you’re holding the knob. So it’s basically a momentary “on”, as opposed to pressing the button underneath the effect, which is a toggle “on”. You can use this for fast, precise control of both the parameter and the on/off state of an effect using just one hand. If you hold shift before pressing the touch button, the FX mode is still activated, but the EQ kill touch mode is also activated. In this mode, touching the bass, mid or treble knobs on any channel instigates an instant kill. I love to kill switches and I miss them on DJ controllers; I can see myself using this function a lot to drop the bass in and out – to emphasise distinctive basslines, for instance. Not content with just a filter per channel, the NS7 II has three filter modes. Like touch mode, they’re triggered by pressing the filter button or pressing it with shift held (or just leaving it off). The first mode is a straight filter. The second activates a short loop at the same time as the filter is turned, getting progressively shorter the further from centre-click you are. The third “turns” the first parameter of the currently selected effect for that channel at the same time as the filter knob is turned, so you can progressively apply an effect with the filter. All great fun, and you do start to get the sense we’re being spoiled here. Still, having said that, it would have been even better to see the filters getting momentary filter/loop or filter/FX combo just by touching the knob; or, more to the point, return to “zero” by just taking your hand off the control. For the sake of keeping this review reasonably concise, I don’t want to go into massive depth on the standard stuff that’s here, so we’ll whizz around the rest of the controller. FX control is as you’d expect from a Serato controller; you can choose between three daisy-chained simple effects, or get deeper control over one effect per side. Each FX engine is assignable to the channels of your choice, and there are the usual three controls (for a single effect each, or three parameters, depending on how you want it set up). Plus, there’s a beat control to change the modulation speed as a factor of the beatgrid. The knobs have LEDs around them which is useful, and there’s a “tap” function for overriding the beatgrid (and also for when using the hardware beatgrid controls). With Serato’s new FX packs, you can get some awesome sounds out of the FX engines nowadays. 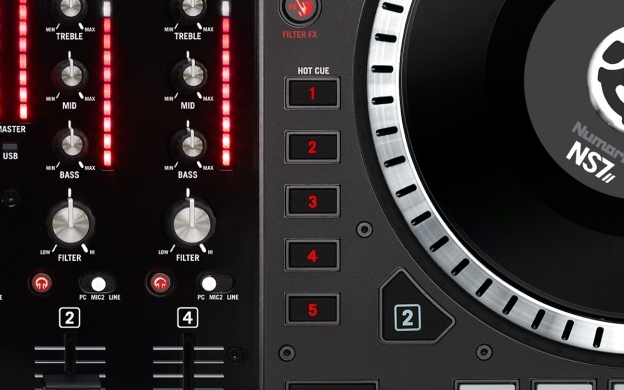 As well as the headline features, the NS7 II has pretty much all the functions you’d expect on a top-end DJ controller. The library navigation controls are pretty solid, the scroll knob doubling up on pushing it as a software views control. There’s an emphasis on searching by album, which you can ignore (as I suspect most will), but that does mean that one of the five pre-set options for sorting a folder’s contents is “album”: Why not have this set to “key” or “genre”? Would be far more useful. Or, allow sorting by the first five columns, and then let the user decide what they’ll be. However, I did like the fact that you can “load” directly to the prepare window: great for sorting out mini-sets within sets. Strip search works really well, even if its name does remind me of trying to get into the USA through customs, and the bleep/reverse toggle is genius: Pushing it up momentarily reverses the playing track for “bleeping” out swearing (ostensibly), but I suspect it’ll be used for fun in most cases; this function demonstrates a “slip” characteristic, so the track carries on playing underneath. But pushing the toggle down actually reverses the track, and – massively pleasingly – the platter starts moving backwards too. I loved it. So let’s move to the analogue functions. The mixer is true standalone, ie it carries on working even if you unplug the laptop. Whereas in some controllers you can route your external inputs – CDs, record decks, microphones etc – through the software if you choose (to take advantage of FX, for instance, or for software recording), on the NS7 II with Serato DJ it doesn’t work like that. 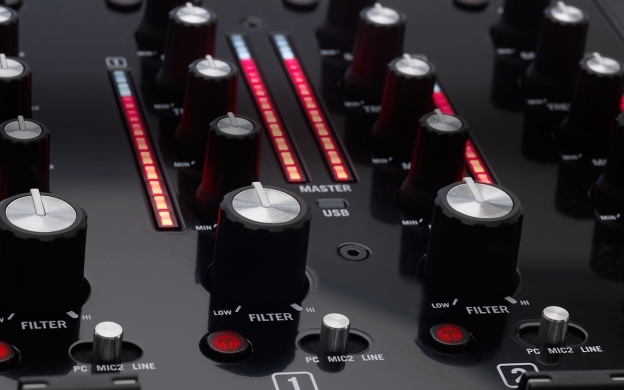 Once you set a channel’s switch to “line”, the NS7 II just acts like an analogue mixer for that channel. The bass, mid, treble, gain etc all work as usual, but the filter doesn’t (as that’s a software control) – unlike the Vestax VCI-400, for instance, which has a true hardware filter, even though in other respects it can act as a standalone mixer with no routing through software. It’s a shame there aren’t hardware filters on the NS7 II, though, like the VCI-400; it would make it a more complete product. The NS7 II’s analogue inputs; two lines, two line/phonos, a mic (there’s another mic on the front too, with its own channel). The two microphone inputs are flexible and nicely implemented, meaning that even for demanding mobile DJ use – with the DJ needing a frequently used mic channel plus an extra one (say, for a wedding speech from a wireless mic) – the unit’s got you covered. The controls on the front for mic 1 basically constitute a fifth, analogue-only mic channel, whereas the mic input around the back is a “floating” mic, that you can switch in any time you like on one of the other four channels, thus taking advantage of that channel’s EQs etc. 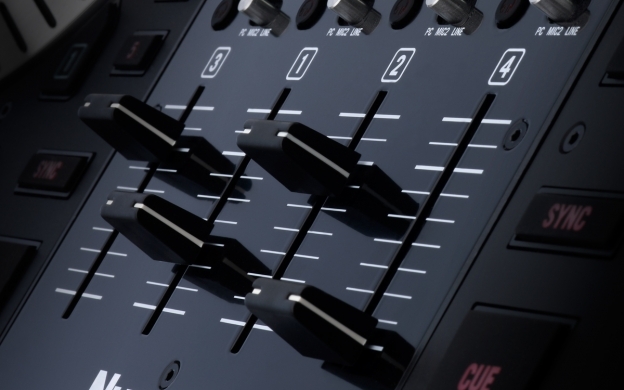 With all the problems the original NS7 has experienced regarding its mic channel and Serato software, maybe it’s not surprising the designers decided to steer clear of software throughput for external inputs this time around. While I don’t really think it’s a big issue not being able to feed analogue inputs through software, if you can’t, I think it is always nice to have a separate Rec Out that bypasses the master volume so you can record your analogue/digital/mic sets in their entirety, while preserving the ability to alter booth and master volume controls as the night dictates. The NS7 II doesn’t have this. This is frankly, going to be a short list. The mixer isn’t as fully functioned as some, lacking line fader curve adjustment, for instance, something which may irk some scratch DJs. It would be good to feed analogue sources through the software to take advantage of software FX and to get around the issue of recording your set in its entirety straight on the laptop. 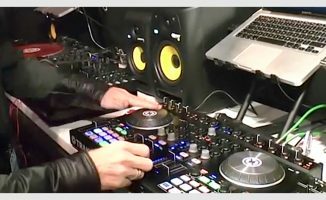 I realise this is probably a limitation of either the software, or (more probably), the reliability of trying to implement this in software, but Traktor and Virtual DJ are both capable of doing this with several of their controllers, and for “the best DJ controller in the world”, it’d have been nice to see that flexibility. And if not, at least give us a Rec Out for hardware recording of sets, bypassing Master and Booth. This is the most fun I’ve had ever used a DJ controller. Funnily enough, the only other controller that has come close in recent years for me is the Novation Twitch, and the reason why I enjoyed them both is actually quite revealing: they both push boundaries. The Twitch packed an insane amount of control ingeniously into a small, lightweight box that I still love DJing on to this day. I have had a Twitch with me in my carry-on luggage on a plane and DJed with it privately, sat in coffee lounges with headphones on. Now that’s digital at its best. At the complete other end of the scale, the NS7 II actually has much of the same innovation as the Twitch packed into its feature set, but combines that with the best attempt ever to replicate what it feels like DJing on vinyl. The motorised platters add a lot of weight, complexity and expense to achieve this, and it’s a little like adding engine noise back to an electric car just to make pushing the accelerator more fun – but it works. This combination – the very best that digital DJing can offer, plus a frighteningly close attempt at replicating the feel of vinyl, is ultimately the strength of the NS7 II. Having those motorised platters there may feel as I said earlier unnecessary and maybe even a little kitsch, but for sheer unadulterated DJing fun, combining the best of the digital and analogue worlds, it’s unbeatable. Of course, the NS7 II has its disadvantages. It’s stupidly heavy. It’s pretty much going to be impossible to turn up and DJ with it in an awful lot of traditional DJ booths, due to its size. And actually, it does miss a few functions that could have been included, as listed above. The NS7 II has five physical hot cues as well as the pad hot cues, which is a smart move, breaking a common use case away from the pads if you’d rather use the pads exclusively for other things. But it has enough genuine innovation (really strong pad implementation, touch kills and the filter modes being among my favourites), that combined with extreme ease of use (great metering, strip search, overall form factor) and real purist features (I loved the platter start/stop speed sand the choice of 33 or 45 RPM) means it can pretty much justify Numark’s claim that it’s the best DJ controller ever made. Traktor lovers will, of course, yearn for it to be Traktor mappable (I wouldn’t hold your breath, frankly; I’d love also to see the platters implemented tightly in Traktor which will be the sticking point, but I can’t see it happening), but for those willing to go with Serato, and wanting a real high-end DJ experience, size no object, you now have two clear options: Happy with fixed jogwheels? Go with Pioneer’s DDJ-SX. Want motorised, vinyl-feel platters? Get the Numark NS7 II. Are you drooling over this controller? Is it everything you could possibly wish for in a DJ controller? Or are there things missing you’d really like to see? Conversely, do you think it’s just too much, moving away from portability into somewhere digital doesn’t need to go? Or do you just wish it was for Traktor? 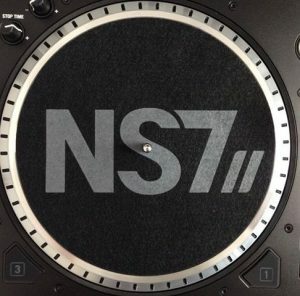 Please share your thoughts about the NS7 II in the comments. If it were not so expensive I would want one just to play with it at home. I would probably never take it on the road, as I just love to slap my controller and cables into a bag when I go DJ in a club and also keep my mobile stuff as small as possible. But darn just for that vinyl feel at home at would be great hehe. I like your thinking ;). As an “oldschooler” (nice terminology btw), I’ve found mixing with non-spinning jog wheels quite the learning curve…I had a play with the NS7 II at BPM and I had the same inane grin on my face that I expect Phil had when playing on the product. As for the crossfader curve, I suspect this is something that can be tweaked via settings in the software, rather than on the hardware. If not, it seems a little odd to introduce spinning vinyl which will clearly appeal to a scratch DJ but not compliment it with the necessary crossfader setting. It has a crossfader curve knob ion the hardware. According to Quartz, it was N.I. who shelved whatever it was they had in that beta that was letting the NS7’s platters be read properly. I’m hopeful that Hedgehog (a friend of Quartz’s) will be successful in getting the NS7 II working properly with Traktor. http://www.native-instruments.com/forum/showthread.php?200101-N-I-PLEASE-pursue-NS7-NS7II-support (says it’s down, must be a problem with the server that hosts their forums, hope they didn’t just outright kill my thread). To be fair, It’s as if they copied the DDJ-SX and slapped motorized platters. I don’t like the UV Meters, or the cramped looking area of the mixer. I wouldn’t say it’s the best controller. That’s because you haven’t tried it. 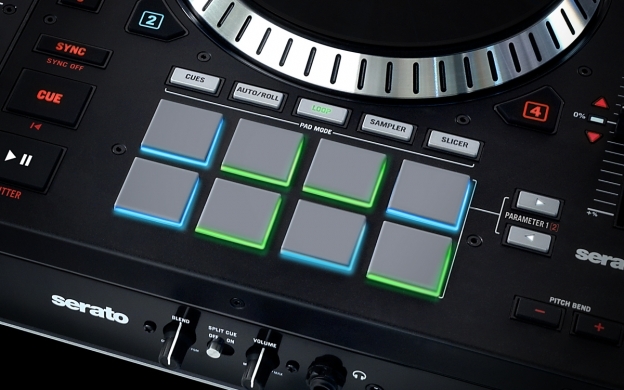 There is no comparison to the DDJ-SX other than 8 pads in the same place. Even the pads themselves don’t even come close. Love the NS7II but disagree motorised jogs are the future as ot me they’re nice to have but ultimately they’re an anachronism for digital gear. Pioneer CDJs have never had them for years and they’re the club standard. Did they fix (on the hardware or software side) the issue the NS7/V7 had with platter movement screwing up the temporary cue point? It was the sole reason I pushed away my V7, and it kinda makes the unit as a whole rather useless if you HAVE to cue with just the platter. Yes, you can see comment/key, and you can also DJ right out of iTunes playlists too. Yes, you can add comment/key columns in SDJ. That’s how I have mine setup. Phil also has a great segment on smart playlists in iTunes. Check that out, it helped me a lot. It’s really easy to just use iTunes playlists; you don’t need to use the serato crates. If you aren’t a fan of Serato’s crates, you can use Alchimie Zinc. It basically mimics Traktor’s Library management. Phil, you went bipolar on this review. Sometimes saying it’s luxury, sometimes saying it’s kitsch. Make up your mind, will you? They two aren’t mutually exclusive You should see my wardrobe. Not Phil but I can answer a few of your questions. Yes there is dual deck control you just hit both buttons. No the NS7 ii won’t fit in a case designed for the DDJ-SX, it is aprox. 4 inches wider and 2 inches deeper. I am assuming there is a sample volume control in Serato DJ. Now I have a question for you, Are you using the Denons via Midi on Serato DJ as well? It has 2 x master outputs (XLR and RCA) if that’s what you’re asking. It looks heavy, in price and weight, but for a small club looking to replace their equipment and going all digital, its quite a bargain. just bought a regular ns7, because i like fader-start. my guess is that fader-start was causing problems for the motors, and that’s why it was removed. 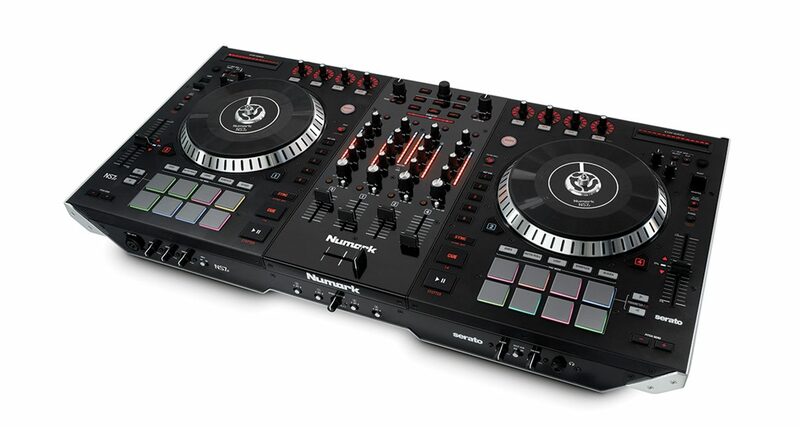 I would love to buy this controller but I’ve already invested quite a bit of time getting used to Traktor and I purchased the Traktor stand alone software. It’s Native Instruments who apparently just stopped caring (even after loads of positive-sounding talk about how ‘excited’ they were to be working on making it happen) – or perhaps saw the threat to their own hardware sales and backed out like Nintendo backed out on Sony (SNES-CD). I’d say the Twitch comes very close indeed. Only major difference I can spot is the Numark’s clever “jump-to-cuepoint-and-loop” mode, which I imagine can be very useful and I had in fact been missing on the Twitch. It really doesn’t seem that large or heavy to me, given that the whole unit weighs less than one Technics 1200 in a flight case. Even the expense doesn’t seem bad: if you think of it as a mixer for Serato DJ it’s cheaper than both the Rane and Pioneer offerings, and it comes with platters! Okay, I really can’t decide between DDJ-SX and the NS7 II. Reason being is the size. I don’t mind carrying the NS7, but are there really a lot of DJ booths that don’t have enough size for the NS7 II? I don’t want to run into a gig, only to find that my deck won’t fit, ya know? I owned the NS7 x 2 years and loved it. However, I always brought my own “table” since I could never be sure what space clubs or booths would have. A simple sturdy keyboard stand with the case on top of the lid worked perfectly. That way it did not matter what space the “booth” had. The little laptop stand works well on the back too. I love the NS7 and NS7II. The only thing I don’t like about the NS7II is there’s no auto start with the cross fader. Lovely Review. My boyfriend just bought the Ns7ii. He would however like to use it with Virtual DJ. Can any one provide me with a link to the complete Ns7ll mapper for the virtual DJ. We tried one but the FX button and the PADS do not light up at all we also can’t use the touch either. Please help to find the correct Mapper. I tried getting one from virtual DJ but wont allow me to download it. I’ve had the NS7ii since Nov and am having the following issues; Master LED lights stopped working and fader will not close on the right side without tape. Very disappointing considering all the talk of being built like a “tank” and ,of course, the price. Can you use iTunes with the new NS7II? I’ve had it for almost a month now. It’s the first controller I’ve ever used and I LOVE it! Watched Phils review a number of times before I bought it. Funny thing is, I still want a 2 TT setup? I have the NS7ii. As a new DJ i really enjoy it. The only thing i dont like is i cannot record my own voice with the mic. If someone knows how to do that please post. Ive tried everything n it just wont work. DJ Smash I too am wondering about how to record the mix–can’t you just run the main outputs or any of the outputs to an external recorder to capture a mixdown that would include whatever sound is being mixed by the Numark? I also have a question I really haven’t seen addressed. Will this deck and others like it with built-in soundcards be recognized by other software simply for recording say a record playing thru the mixer? Or is that something Serato can easily handle? For example, I like to edit waves with Audition for its simplicity.